Inside: How to plan the perfect family vacation. Pick the perfect destination, plan everything effectively, and have a fun time making memories. I love a family vacation. Traveling has always been one of my favorite things to do. While a lot of people get bored in a car for long hours, I get a thrill seeing the different landscapes as you drive mile after mile. I always said when I was younger that I would love to live in a different area of the world for 4-12 months at a time to get a feel for what it is like there. That sounded fun before I had kids; now I of course prefer stability and sending my kids to school, so we travel. We didn’t always travel long distances. When my family as a whole was a younger family, we traveled close to home and for shorter spurts–more “long-weekends” than full vacations. I don’t regret that; it was the best for our family of nappers and littles at the time and we still had a lot of fun. Now that my family as a whole is in the middle stage of raising kids life, we are in full-on travel mode. We have a list of destinations we want to hit before Brayden, our oldest, graduates high school (only five years folks!). We are taking full advantage and getting our travel on. Prepping for a trip is not easy, and let’s be real, for most families, the bulk of the burden lands on mom. Mom plans the trip, mom preps the pets and house to be left, mom packs her stuff, mom packs her own stuff, and mom answers dad’s 65 questions while he packs his own stuff. Not to discount the stress or efforts dads put in to a trip, but in most cases, mom puts the most effort into prepping for a trip. All of this added burden (for fun, but a burden all the same) to everyday life can lead you to feeling stressed and extra grumpy. My husband and I both really strive to stay as patient as possible as we prep for a trip. We don’t want vacations to be dreaded because it means mom and dad go into major grump mode. 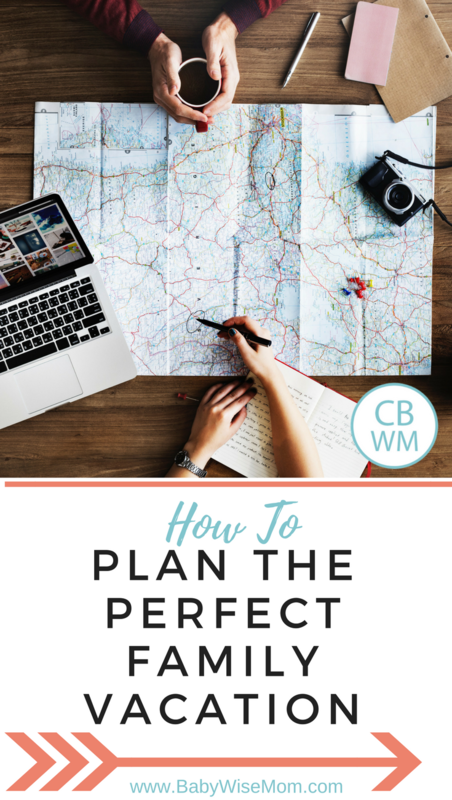 One of the best ways to stay calm and collected is to have a plan for how to prep and plan for the trip. 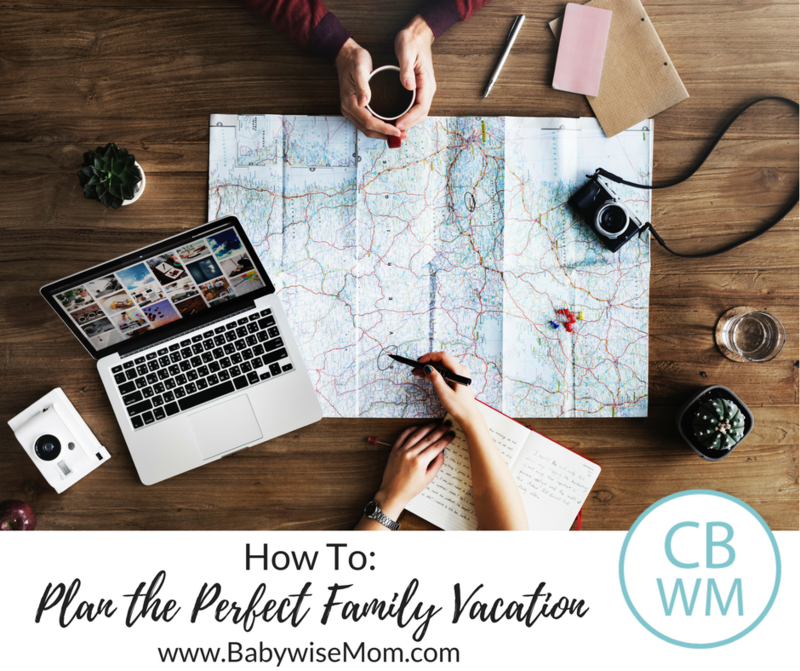 Here is my method for planning the perfect family vacation. 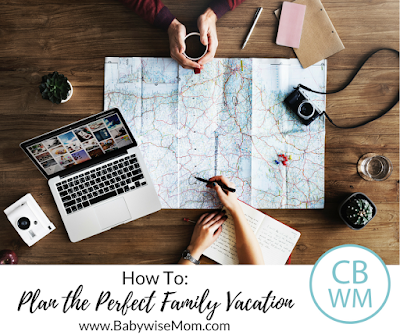 The first thing you need to do when planning a family vacation is to decide where to go and when to go. I really like having a master list of places we would like to go. We always decide at the end of one trip what our next one will be. Consider things like how far away it is, how expensive-ish it would be and how that would fit in with your budget, and how your kids would handle it at their ages. Not all places are great for kids at all ages. For example, on our someday list is Washington D.C. This is a very far away destination for us, so it is a once in a lifetime type of trip. We plan to wait until Brayden is a senior before we go there. There is a lot of walking involved and we want our kids old enough to be able to physically handle that. We also want them as old as possible to hopefully appreciate what is there. Once you know your location, get some date options. Look up online great times to travel to the location. What is a less busy time of year? Those will be less expensive and less crowded. Look at the weather at the different times of year you are considering. Be sure to consider school dates and work needs when considering your travel dates. We plan to go to Florida next year. We wanted to go over spring break, but once I started researching, I soon realized Florida has spring break the same time we did…it was literally twice as expensive to book lodging as other times of year we could go. So we are looking at other date options. How will you get there? Drive? Fly? Where will you stay? Rent a home? Hotel? All-inclusive? Where will you go? Figure out how far in advance you need to book things. You can shop around and find better deals the earlier you start booking. If you are going to a show or game of some sort, you can get better seats if you buy tickets earlier. Google best times to fly. Search for things in an “incognito” window so the Internet doesn’t remember you are looking. Flight prices in particular will jump if you forget this step. We love to stay somewhere with at least a little mini fridge so we can pack lunches when possible. We don’t like eating out for every single meal, plus it saves money to pack food. We typically try to eat out no more than once each day, and try to do less if possible. Decide where you will be eating meals, and then plan what they will be and where you will eat them. Also, in planning your food, don’t forget to have some snacks planned. Kids are much more pleasant if they aren’t hungry, and often when traveling, you are moving around more and kids can get quite hungry. If we are not flying, I like to make food ahead of time to take with us. I will boil some eggs to have as snacks. I will bake some banana bread. It is a great way to use up food that would otherwise go bad and have some yummy snacks for your trip. Taking a vacation with the money pre-saved makes the trip a thousand times more enjoyable. I love buying things ahead of time as I can to spread out the expenses. I always estimate how much the entire trip will cost and figure out how to save for the trip so that while we are on the trip, it is all paid for and the money is there to cover what isn’t already paid for so we can just enjoy the trip without worrying about going into debt. Make a packing list for each person so you can check things off as you pack. I try to pack light, but I also want everything we need. I always pack 1-2 extra pairs of underwear and socks per person just in case something happens. I even make a packing list for my husband so he can just consult it instead of asking me what he needs to pack and if there is anything else he needs. Be sure you think through your activities and that you have what you need to do them. I mentally walk through each day so I don’t forget anything. Check the weather of where you are going and have plans for inclement weather happening. What will you need if it rains or snows? Do you have what you need for the sun? What is the climate like? Is it more humid? Are there lots of bugs (and bug spray needed)? If you like to have a fresh hair-cut or you want your nails done, make sure you make the appointments with enough time. If you need to see a doctor for any reason (certain vaccinations, clearance, medications, etc.) be sure to schedule with enough notice. There are a variety of things you need to prep at home before you go. I always like to put a hold on my mail. You can go here to set up your own mail hold. If you have pets, find someone to take care of them while you are gone. We always get a neighbor. You might need to board your pet at the vet or a boarding place. If you have plants or a garden going, you will want to make sure you have someone lined up to water those things if needed. Let your work colleagues know when you will be gone. Arrange for your responsibilities to be covered while you are gone. If your child is in daycare, let them know. If your child will miss school, talk to the teacher ahead of time. They will often gather up work your child will miss so he/she can do it ahead of time. If your child is in dance, music lessons, or a sport, be sure to let those in charge know your child will be missing. It is also smart to tell neighbors you trust that you will be leaving and your dates. It can help them keep an eye on your house and know if they see things going on that something isn’t right. It is also smart to let your family or close friends know when you are going, how long you will be there, and how you will be traveling. That way if something happens, someone knows you aren’t where you should be. In the last couple of days before you leave, make sure your electronics are ready to go. If you plan to take a Kindle, make sure the movies and books you want on the device are loaded. Make sure your devices are charged fully. If you will be driving at all for your vacation, clean your vehicle out. Check the fluids and the tire pressure. Get the oil changed if it is due. Fill up with gas. Be prepared and ready to go. Just before you leave, there are some things you will ideally do. One is clean up a bit. I love coming home to a clean house and it is so nice to not have a mess on top of the mess you bring home. You will have unpacking and laundry to take care of. If you have the time, clean your refrigerator out in the few days before you leave. You can get food out that is bad or about to go bad. It is also wise to empty all garbages just before you leave so you don’t have anything in the house rotting and/or stinking up the place. Check the windows and doors and make sure all are locked. Do a walk through and make sure the lights are all off and the electronics are unplugged. Turn down or up the thermostat (depending on the time of year). Before you leave, give your pets and/or plants one last check/feeding/watering.